The Harvest of the Month (HOTM) featured item for April is blueberries. Check out these resources and ideas to celebrate Harvest of the Month with local blueberries! Serve fresh blueberries as a fruit serving on the breakfast or lunch menu or use as a garnish for added pops of color. Add fresh blueberries to a yogurt smoothie or parfait. Create a fresh fruit salad with blueberries and other fruits, such as strawberries, raspberries, cantaloupe or any fruits in season. Toss fresh blueberries in a green lettuce or spinach salad, along with strawberries and serve with a light vinaigrette. 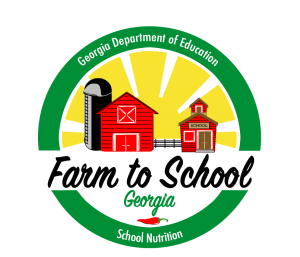 U.S. Highbush Blueberry Council – School food service recipes. New School Cuisine: Nutritious and Seasonal Recipes for School Cooks by School Cooks, from Vermont FEED. Page 24, Blueberry Soup. What’s Cooking? USDA Mixing Bowl – search for quantity recipes using blueberries. Offer a taste testing of fresh, local blueberries and have students evaluate if they liked them. Taste test this Georgia Grown Kale and Blueberry Salad. Try a blueberry smoothie with this Create-a-Smoothie recipe from the National Dairy Council. Q: Why were the little blueberries upset? A. Because their parents were in a jam. Q: What do you call a sad strawberry? A. A blueberry. 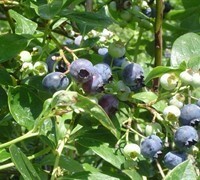 Georgia Blueberry Commission – find recipes, facts, nutrition and history information on blueberries. U.S. Highbush Blueberry Council – the website offers nutrition information, recipes and cooking tips, information on growing blueberries, and a school food service section. Blueberry Education Activity Ideas – coming soon. If conducting taste testing activities in the classroom, review this Taste Testing Tool for ideas on how to integrate activities into the curriculum. Fruit-a-licious Breakfast Cup – from USDA. What’s Cooking? USDA Mixing Bowl – Search for recipes using blueberries in this interactive website. The website includes a searchable database for healthy recipes and can help with meal planning, cooking and grocery shopping, from the United States Department of Agriculture, Food, Nutrition and Consumer Services. MyPlate 10 Tips: Focus on Fruits – English – A one page tip sheet on choosing more fruit, from USDA, Center for Nutrition Policy and Promotion.